All of our sites are fully serviced, offering cable and internet, water and sewer. Whether nestled amongst tall Douglas firs, or front row along the water, Salmon Point offers a selection of RV sites to suit you. Choose from 30- or 50-amp depending on the size and needs of your RV. Our Front Row sites are definitely for the Big Rig. Sites are 30’ wide and 60 to 80’ deep. The sites are located under Douglas firs and overlook the Marina, Georgia Strait and the Coast Mountain Range. All sites are full-hook-up with 30 or 50 amp, including Cable TV and Wi-fi. Propane fires are welcome as well as easy access to park facilities. There is a size requirement of 25 -30’ + during peak times. Sites are open year-round. Our Waterview Row A is located under the trees. 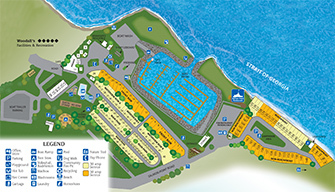 Sites are between 38’ – 45’ deep and are conveniently located in close proximity to park facilities, beach access and community fire pit. These sites are grassy with full-hookup including 30 amp and have some view. Best suited for units up to 25’ with tow. Propane firepits are welcome. Sites are open year round. Our Waterview Row B is located under the trees with full-hookup including 30 amp power, cable & wi-fi. These sites are also big-rig friendly being at least 30’ wide and 70 ‘ deep. As the sites are back-in only and staggered with the Front Row, many sites have a view of the Georgia Strait and Coast Mountains. These sites are located moments from the park facilities. Propane fires are welcome. Sites are open year round. Our Main Park treed sites are full hookup with 30 amp sites. These sites are approx. 18’ wide and 46’ deep. They are best suited for units up to 26’ with tow. Small tents are permitted with a unit is this area. Propane fire-pits are welcome. Sites are in close proximity to the washrooms, pool, kids games room, play-ground and hot-tub. Sites are not far from beach access and the community fire pit. Our Main Park sunny sites are full-hookup just moments away from park facilities. Flat, spacious sites that are best suited for units up to 25’ with tow. Propane fire pits welcome. The Lighthouse waterfront sites are located right at the beachfront overlooking Georgia Strait and the Coast Mountains. Sites are big-rig friendly with full-hookup 30 amp and 50 amp and include cable & wi-fi. These sites have excellent satellite reception as there are no trees in this area. Wood Fires are permitted at these sites and a fire pit is provided on a raised patio. The non-waterfront Lighthouse area sites are all full-hookup sites with 50 amp power and include cable, wi-fi and excellent satellite reception. The sites are big-rig friendly and many back onto a nature conservation area. All units staying in this area must be able to hook up to all services. Easy access to the Oyster River Nature trail, local restaurants, washrooms and laundry facilities and only minutes from the rest of the park facilities. Our protected sites are perfect for winter camping, and our mild weather offers a great alternative for snowbirds. *Tents only permitted in designated areas. Fires only permitted in designated areas.